You'll be £14.99 closer to your next £10.00 credit when you purchase Secrets of the Spitfire. What's this? Order within the next 42 minutes to get your order processed the next working day! This book tells the tale of the brilliant aerodynamicist Beverley Shenstone MASc, HonFRAes, FAIAA, AFIAS, FCASI, HonOSTIV. As R.J. Mitchell's chief aerodynamicist, it was Shenstone who designed the Spitfires wing the wing that gave the Spitfire its crucial advantage in the Battle of Britain and beyond. A quiet man, Shenstone never sought glory for his work, yet in recent years he has been credited as the man who persuaded Mitchell to adopt the ellipse a modified ellipse that was unique in its shape and its combined use of two integrated aerofoil sections. Shenstones knife-edge shape reached far back into early aeronautics for its inspiration. This book also names the other forgotten Spitfire design contributors who were Mitchells men Mr Faddy, Mr Fear, Mr Fenner, Mr Shirvall, a Prof Howland and others. Intriguingly, Shenstone had left his native Canada and early training as an RCAF pilot, to study at Junkers and then under the father of the delta wing Alexander Lippisch in Germany in the early 1930s. There, he became immersed in delta wings and flying wings. He also became a glider pilot. The story of how Beverley came to be in the right place at the right time is revealed for the first time. So too are the enigmatic tales of his involvement with the military, the intelligence world, Lord Beaverbrook, the USAF, and Canadian aviation. During the war Shenstone worked at the top secret Wright Patterson air force base and was involved with the Air Ministry and the pro-British movement in America when Shenstone worked for Air Chief Marshal Sir Wilfrid Freeman, the unsung hero behind British defence procurement. Shenstone achieved high office a President of the Royal Aeronautical Society, technical director at BOAC, chief engineer at BEA and a consultant to several aircraft makers. He was courted by Avro, de Havilland and Vickers, and was the force behind the renaissance of human-powered flight. Using exclusive access to his family documents, his unpublished autobiography and many notes and stories, as well as forensic research, this book details for the first time, a new twist to the Spitfires story and the secrets of its advanced science. A tale of design and military intelligence reveals a story of a man whose name should be more widely known in the UK, Canada and the aviation world. The Supermarine Spitfire holds the record of the most treated aeroplane, therefore it seems incredible that there are still unknown facets and information after more than 80 years since the first flight. Testament is this book published by Pen & Sword that treats in detail the fascinating biography of Beverley Shenstone, the soul behind the perfect wing of the legendary British fighter. Anyone interested in seeing how talented engineers seek and find solutions toward flight characteristics...should find Secrets of the Spitfire a satisfying read. In his latest tome, Secrets of the Spitfire (Pen and Sword 19.99) Lance Cole tells the story of the Canadian aerodynamicist Beverley Shenstone. While Shenstone is not a household aviation name like RJ Mitchell or Sir Sydney Camm, the evidence in Cole’s fascinating book suggests perhaps he should be. The Canadian, who trained as a pilot with his national air force briefly joined German aircraft manufacturer Junkers during the early 1930s before moving to Supermarine in Southampton where he oversaw design of the Spitfire’s elegant elliptical wing. He was later offered the chief designer’s role at Supermarine owner Vickers (a job that was ultimately taken by Sir George Edwards) and went on to serve as engineering boss with BOAC and BEA as well as being president of the Royal Aeronautical Society. This superbly written and researched book provides an excellent and entertaining insight to a hugely influential participant in the UK’s 20th century aviation scene. 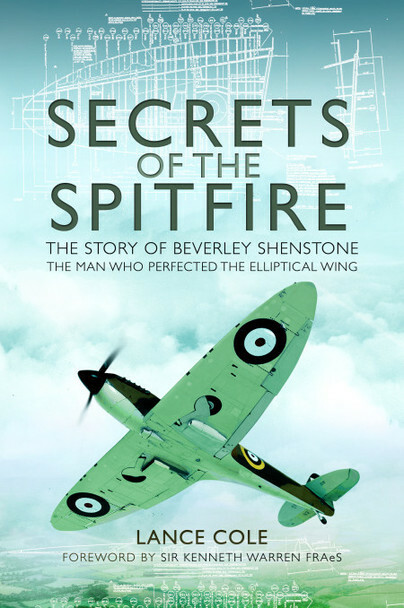 The Supermarine Spitfire must rival the Porsche 911 in terms of the number of books written about it - but this engrossing hardback has just one target in its sights: to put the record straight about Beverley Shenstone, the aerodynamicist responsible for the Spitfire’s famous elliptical wing. Its surprisingly complex low-drag, high-lift design gave the Spitfire a unique advantage, yet Shenstone has never received the credit he deserved. The author convincingly demolishes the myth that it was inspired by the mid-30s Heinkel 70 – although Shenstone did, intriguingly, work at Junkers in the early ‘30s – and explains in detail why it was such a landmark in aeronautical design. While packed with fact, this is a very readable biography of a man who literally changed history. " I just finished reading this truly excellent book on the Spitfire and just as importantly Beverley Shenstone who was instrumental in guiding the aerodynamics of the wing resulting in the unique forward swept modified ellipse that made the Spitfire what it is. The author Lance Cole is commended for digging deeper than previous authors in writing about the Spitfire, admittedly with the help of the Shenstone family providing the diaries and notes of Beverley Shenstone. The story provides a rich background of his time prior to Supermarine, working with Junkers and Lippisch in Germany in the early thirties where he gained invaluable experience on the design of wing shape and tailless designs. It debunks many of the myths that have unfortunately emerged mainly on the internet, one of which is that RJ Mitchell got the idea for the elliptical wing for the Spitfire from the German Heinkel He 70. The wing design that Shenstone used was an original design and was a considerably modified elliptical profile whereas the He 70 was a symmetrical ellipse. He also used two NACA thin wing aerofoil sections and developed and modified them across the span to calculated thickness to achieve the required performance. There were numerous other special features that were developed and designed into the wing shape the majority of which came from Shenstone's mind, he refined the shapes mathematically, not having the luxury of advanced wind tunnels and CFD programs that today's aerodynamicists have. It also shows how RJ Mitchell did not create the Spitfire single handed, as is so often touted by less thorough authors and media when writing on the Spitfire; it was a team effort by many brilliant minds that together created what was the most aerodynamically advanced aircraft of its time. The proof being that the Spitfire was able to be developed throughout the war to match every new development the Germans came up or most of their new piton engined aircraft designs. The Hurricane the Spitfire's Battle of Britain stable-mate became outdated very quickly by comparison; a good aircraft but not an advanced one by any means. It used technology from the pre-war Hawker bi-plane models as a low risk route to providing a monoplane fighter. It clearly shows that the Supermarine design team were the "dream team' of their time, with so many great thinkers all pulling in unison. It also shows that while the work they performed was incredibly stressful it was rewarding and that working for RJ Mitchell was enjoyable, which probably helped get the most out of the team. The other area the book delves into is Shenstone's post war career and shows him as a trailblazer in the field of running the technical and maintenance engineering department of BEA (British European Airways) in the post war era of austerity. BEA was later to become British Airways along with BOAC when they were both nationalized by the UK government. This book is a revelation of facts and information on the Spitfire design that has never before seen the light of day. It requires some basic aerospace and aerodynamics knowledge, for which I enjoyed it even more being an aerospace engineer, but saying that it is still a very readable story for anyone with no prior aerospace knowledge. It also has a number of new never before seen photos from the period of the development of the Spitfire. The only thing which I would have liked to have seen would have been some technical drawings showing the wing, spar position, ailerons etc. where they would be applicable to the story about those areas. However that did not detract from the overall enjoyment. Now what other Secrets are there of the Spitfire, maybe a follow-on book giving us the in-depth story of RJ Mitchell and other key members of his team looking at the unique challenges of the structure, power plant, manufacturing, production issues etc. A pleasure to read. This is one of those books that an aviation enthusiast cannot be without. For the many Spitfire enthusiasts out there I assume this book adds a slightly new twist to the history of its design. As in other such scenario's, it appears that Beverley Shenstone persuaded R.J. Mitchell to use his modified ellipse design wing. Mitchell is hugely respected as chief designer but Shenstone's work must also be credited as a major part of the Spitfire's success. Something us Brit's must be eternally grateful for. Whilst I enjoyed this book I have to say for me it is written for those with a real knowledge of all things Spitfire. Some of the technical details were a lot to decipher and store for one so ignorant in aeronautical history and design. What I found fascinating was the journey this man's life took and the lengths he went to become a truly respected designer. Oddly enough much of Shenstone's knowledge came from years at the Junkers factory in Germany in the 1930's. During his time in Germany he also became a qualified glider pilot, something that aided his development of the Elliptical Wing. There are by my count 26 black and white images included. Some of them have never been seen before and this makes this book even more desirable to the Spitfire faithful. Included are images of the Type 224 pre-Spit prototype, never seen before. Shenstone worked with several military agencies during the war and must be seen as one of the unsung heroes behind the scenes as it were. It would have been easy to look past the contribution this man made until now. I am sure R J Mitchell himself would like to see Shenstone applauded for his work on the Spitfire wing. As well as becoming President of the Royal Aeronautical Society Shenstone's career also saw him take office as technical director at BOAS as well as chief engineer at BEA. For aviation and Spitfire enthusiasts this is a great read. Lance Cole (48) has been a journalist and author for over 25 years. He was the 1983 Sir William Lyons Scholar and has written features and news items for all the major automotive and aviation titles. Syndicated worldwide, he has also been a columnist with The Daily Telegraph, The Independent, The South China Post, and numerous imprints. He is a regular broadcaster – including with BBC Radio 4. He is the author of 8 books - notably Vickers VC10 with a Foreword by Brian Trubshaw, and Heavies – voted by Alan de Botton as one of his favourite books. Lance is well known for his regular opinions in Flight International magazine. He is a glider pilot and trained designer.